which may exacerbate the emotional effects of the disease. Medical treatment of acne is determined by the extent and severity of disease, prior treatments, and therapeutic goals. Each regimen must be followed for a minimum of four to six weeks before determining whether it is effective. The following table lists guidelines to be used in the treatment of acne. Occasional papules, few pustules mixed with comedones. Topical tretinoin and benzoyl peroxide and/or topical antibiotic. If acne is resistant to above therapy, add oral antibiotic. Red papules, many pustules with prominent scarring. Red papules, extensive pustules, many deepseated nodules & cysts. Topical keratolytic therapy is recommended as the primary treatment for comedonal acne to prevent new acne lesions as well as to treat preexisting ones. Two classes of keratolytics, tretinoin (retin A) and benzoyl peroxide, can be used alone or in combination with each other and will control 80 to 85 percent of acne. Both topical creams mixed together Tretinoin and Benzoyl Peroxide should never happen and even be applied immediately after one another. Cream preparations of both tretinoin and benzoyl peroxide should be used because they are less irritating to the skin than gel forms. Tretinoin has a propensity to severely irritate the skin if used incorrectly. To avoid irritation, a low strength Tretinoin Cream 0.025%, or Tretinoin Cream 0.05% should be applied every other night for one week and then nightly. In addition, because skin treated with tretinoin is more sensitive to sun exposure, sunscreen should be used. Tretinoin should be avoided during pregnancy because of the potential of photoisomerization to isotretinoin, a teratogen. 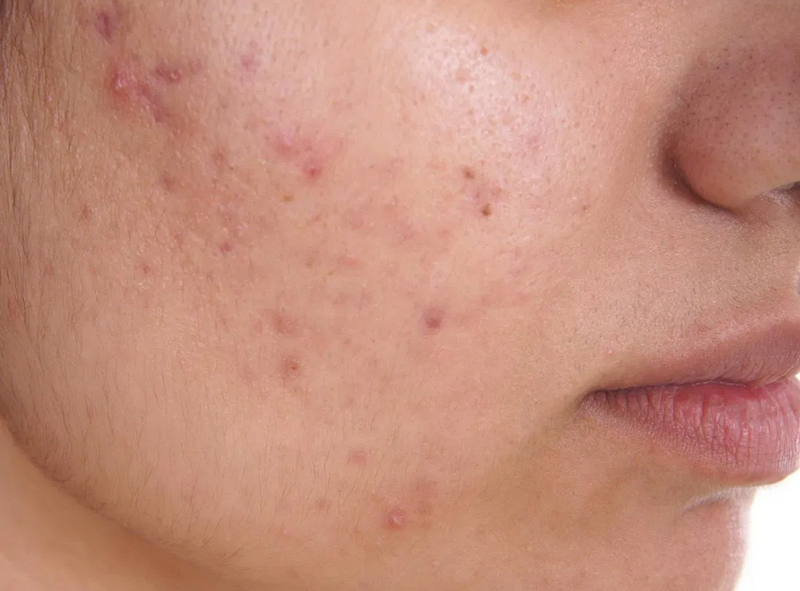 Improvement of acne after treatment of tretinoin can take six to 12 weeks and flare-ups of acne can occur during the first few weeks due to surfacing of the lesions onto the skin. Benzoyl peroxide is available over-the-counter in various strengths and applications (gels, creams, lotions, or soaps). All concentrations seem to be therapeutically equivalent. Mild redness and scaling of the skin may occur during the first week of use. Topical antibiotics decrease the quantity of P. acnes in the hair follicles. However, they are less effective than oral antibiotics because of their difficulty in penetrating sebum-filled follicules. Topical Erythromycin and Clindamycin are similar in effectiveness and can be used once or twice a day. Some percutaneous absorption may rarely occur with clindamycin, resulting in diarrhea and colitis. Topical antibiotics are frequently used in combination with keratolytics and are most useful for maintenance therapy if improvement after one to two months of oral antibiotics is observed. Patients with moderate to severe inflammatory acne will require oral antibiotics in addition to topical therapy. Tetracycline and Erythromycin are the most commonly used systemic antibiotics. Minocycline is also effective with more convenient dosing; however, its cost limits its use to those patients with severe or recalcitrant acne. The oral retinoid isotretinoin (Accutane) has been proved very effective therapy in treatment of nodulocystic acne resistant to standard regimens. 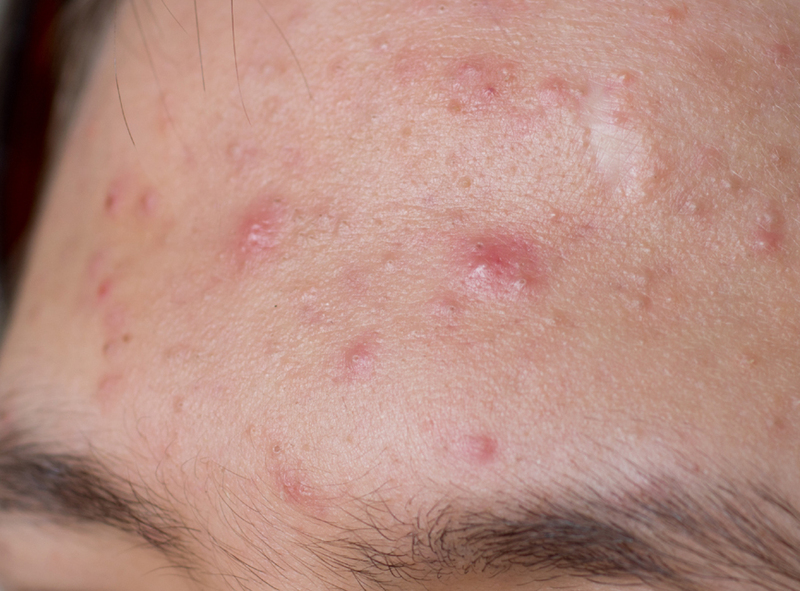 In appropriate regimens, isotretinoin has resulted in long-term remission of acne in approximately 60 percent of patients treated. Because of its severe teratogenicity, isotretinoin should be avoided during pregnancy. Side effects of isotretinoin include dryness and scaliness of the skin, dry lips and occasionally dry eyes and nose. It can also cause decreased night vision, hypertriglyceridemia, abnormal liver function, electrolyte imbalance, and elevated platelet count. 10% of patients experience mild hair loss, but the effect is reversible. Because of the seriousness of these side effects, isotretinoin should be reserved for patients with severe acne who have failed previous therapy. Smoking cigarettes causes blood vessels to get small (constrict) and prevents blood, oxygen and nutrients from flowing to the body tissues. Edema or swelling caused by fluid collecting in the tissues, usually occurs in a part of the body that is not moved frequently and is below the level of the heart (i.e., the feet, legs and hands). Skin over areas of edema becomes thin and pale and injures easily because of poor circulation. Edema can be prevented by elevating your legs and hands frequently, performing regular Range of Motion (ROM) exercises and wearing compressive stockings. Vascular Disease or a narrowing of the blood vessels, can be caused by diabetes, smoking, high blood pressure or elevated cholesterol. The result is decreased blood flow to the skin. Work closely with your health care provider to manage conditions that can lead to vascular disease and cause skin problems.